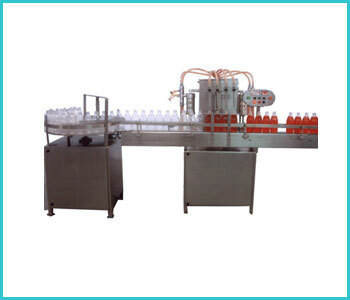 Automatic 4 Head Liquid Filling Machine is a compact, versatile model, covered with very elegant look S.S.304 Material, It is a GMP Model, The unit consists of S.S. slate conveyor, Turn-flat & No container – No fill system. All exposed parts are of S.S.304 for corrosion free long life. Sturdy vibration free construction for trouble free performance. No Container – No fill system to prevent spillage of material. Adjustable S.S. container guide to match the perfect center. High precision filling syringe to achieve high accuracy in filling volume and drip proof performance.